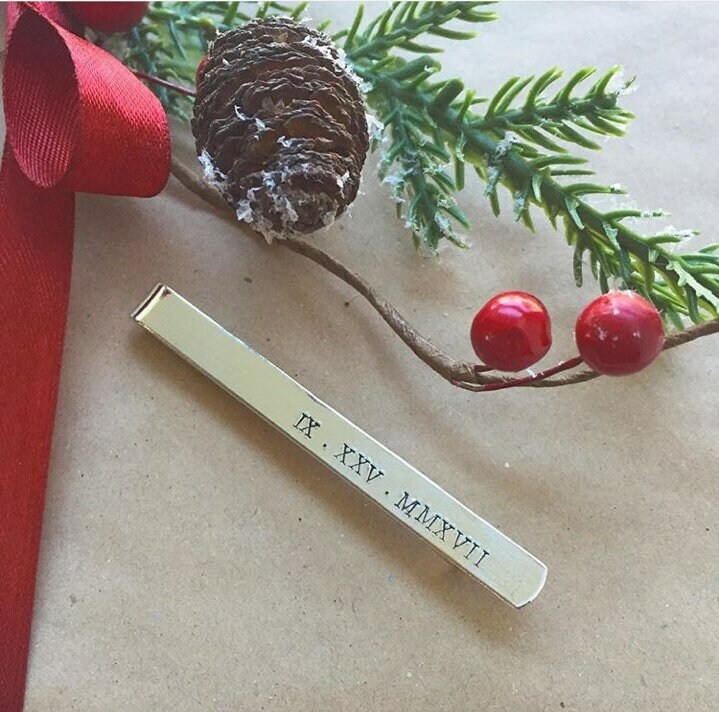 Tie Bar, Tie clip, Groom, Roman Numerals, Christmas gift, Father of the Bride, Father of the Groom. Customized, personalized. A perfect little accessory for the perfect man in your life, whether it be your future husband, future father-in-law or your father. Please let us know which one you would like when checking out. If you would like your personalized tie clip, please let us know the wording in the Note to Seller box. Price is for the handstamping of the front only. To handstamp the back, please contact us for a quote. 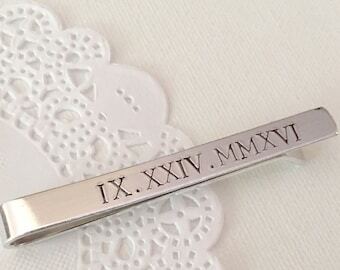 Tie Bar, Tie clip, Groom, Roman Numerals, Father of the Bride, Father of the Groom. Customized, personalized. Tie Bar, Tie clip, Father of the Groom, Father of the Bride. ADD on to our Tie Bar Listing. 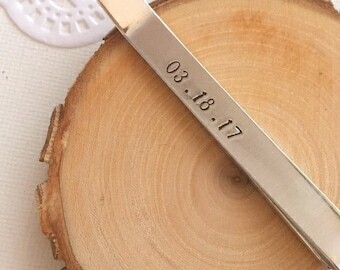 Handstamp the back of Tie Bar, Tie clip, .Customized, personalized. SAMPLE SALE. Tie Bar, Tie clip, Like a Boss, employer, work. Father of the Bride gift, Father of the Groom gift, Golf ball markers. Set of THREE. Includes Free personalized notecard, organza bag. Father of the Bride gift, Golf ball markers. Set of THREE. Includes FREE personalized notecard, organza bag. Tie clip, snowflake, groomsmen gifts, groom, wedding party gift, winter wedding. Comes with FREE personalized notecard and jewelry box. Mother of the Bride, Groom, handstamped charm, pearl bracelet. Comes with FREE personalized card, other colors available. Midwife, Obstetrician, Doctor, pregnancy, handstamped, gift, keychain, zipper pull. Name necklace, design, handstamped charm, glass pearl. Choose your color. Name necklace, handstamped charm, glass pearl. Choose your color. Pet owner, dog, bone, birth stone, new owner Necklace. Godfather, ask, cross, handstamped keychain. FREE Notecard.